I have always liked the double ended boats, maybe that was because my peapod was double ended. But there is a problem with these boats, small double ended boats didn't have a lot of comfort space. My wife didn't like to go out in the peapod because there wasn't any room to sit. I liked gaff rigged boats because of the larger sail area with lower center of effort, but they do have the greater weight up on the mast due to the gaff. The boat I was looking for had to be trailerable and be capable of sailing in shallow water, so a fixed keel boat was out. I guess I just wanted a plain ole' sloop rigged sailboat. I found one (the Glen-L 19) in Texas. It was a salty looking thing and I thought it would serve my needs as a project boat and sail thing. Do not use plain steel screws! It does not matter that the hull is covered on the outside with fiberglass and resin. Water gets on the inside from rain and condensation. Even Maranti plywood will rot with nail sickness; so does Cyprus. 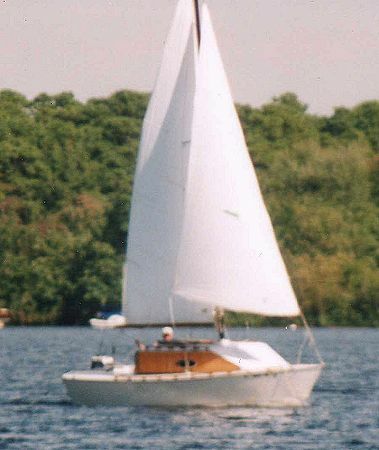 I think the Glen L 19 is a good sailing boat. 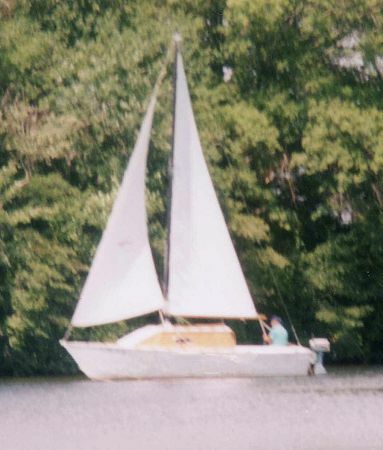 It sails well into the wind and has enough mass to make turns into the wind without backwinding the jib, something a good Hobby Cat friend insists on doing, which reduces progress by over correcting for a problem that doesn't exist. The 19 has almost cavernous interior, as long as you are 4' tall, just sit there. The lack of the mast through the roof and the flat floor only adds to the roominess. I have noted that there is only one other Glen L 19 in the archives. That is surprising in that it is one of the largest boats that can be trailered and sailed easily single handed. Sometimes I just can't get a crew together to sail.